Nomacorc, a US producer of alternative wine closures, introduces a new zero carbon footprint wine closure, Select Bio, which is said to be the world’s first. It was presented at the Intervitis Interfructa show, held from April 24-27 in Stuttgart, Germany. 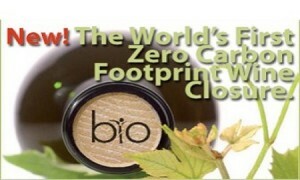 Select Bio closures are 100% recyclable and made from renewable polymers derived from sugar cane. The closures will mirror Nomacorc’s current Select Series portfolio in oxygen management performance, minimizing the environmental impact of wines by preventing spoilage and waste from wine faults such as oxidation and reduction, introduces the company. Select Bio is especially suited for organic and biodynamic wines that minimize the use of sulfites for wine preservation. Nomacorc notes that its patented co-extrusion process has the ability to control oxygen ingress, reducing a wine’s susceptibility to spoilage due to oxygen mismanagement while improving post-bottle aging and bottle-to-bottle consistency. As said, incorporating plant-based polymers into Nomacorc’s formulation fully offsets positive emissions originating from conventional raw materials in the product, resulting in closures having a zero carbon footprint. The Select Bio Series will include three distinct products, each with different oxygen ingress levels. It will have the same look and feel as the traditional Select Series including serrated ends, chamfered edges, custom side printing and optional custom end-printing.